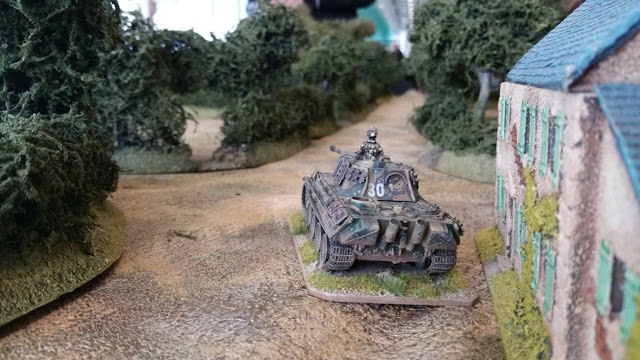 Our club (The Harrogate Wargames Club) ended up putting on two games at this years Vapnartak wargames convention organised by the York Wargames Society the York Racecourse. The first game run by John S and Gavin was a 7TV game (rules devised by Crook Dice). The second 'Kesslers Crossroads' was a 20mm tank game using the Two Fat Lardies rules set 'What A Tanker!'. John Elwen and myself ran the three participation games, 4 Sherman 75s taking on a lone Panther tank defending a crossroads. This is a homage to the real life event called Barkman's Corner (or is it in fact a myth ?). To give the lone Panther a chance, the crew were rated as Elite and as per the rules could convert any 1 Command Dice. Three entertaining games were played over the day with the Panther (mainly run by me) getting KO'd on each occasion. 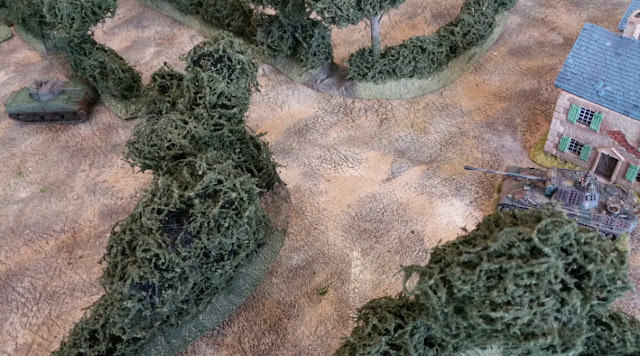 I've started a small hobby business in New Zealand making terrain for tabletop wargaming. I see you feature a bit of WW2 and sci-fi content on your blog. I was wondering if you'd be interested in featuring my terrain on your blog?